The solar-powered trash cans arrived in July 2017 as part of the mayor's $32-million plan to combat vermin in rat-popular neighborhoods, like this one. The Daily News reported at the time that each can costs $7,000. Philadelphia bought hundreds of Big Bellys in 2009 under the assumption that they would save millions of dollars in labor costs. Instead, the bad technology forced them to hire a new crew just to fix them, and they wound up spending $6.5 million more than they planned. The units broke down, did not alert the city when they were full, and scavengers even stole the handles for scrap metal, making them impossible to use. Philly is now replacing the old Big Bellys with new ones with foot pedals which they are getting for free in exchange for ad space, but they wil still have to pay for some maintenance. It’s too bad Bill DeBlasioof didn’t bother to ask Philadelphia about all the problems they had already experienced since 2009, before buying $32 million of these things for New York in 2017. I can almost remember when DeBallsio was the public advocate, whose job it was to solve problems and not create new one. The high-tech things cost $3,700 each, as opposed to $100 each for the no-tech wire baskets which they replaced. BigBelly works off a 12-volt battery powered by a solar panel and reportedly holds five times more trash than wire baskets. Busy ones overflowed anyway, and the technology that was to alert the Streets Department when they were nearing capacity often failed. The trash compactors broke down and the city needed a five-person squad dedicated to fixing that, an unforeseen expense. In a cost analysis, city Controller Alan Butkovitz reported that when maintenance and parts were factored in, the trash compactors cost the city more like $6.5 million because of bad technology. Not as bad as cell phones and hover boards that spontaneously burst into flames, but bad enough. 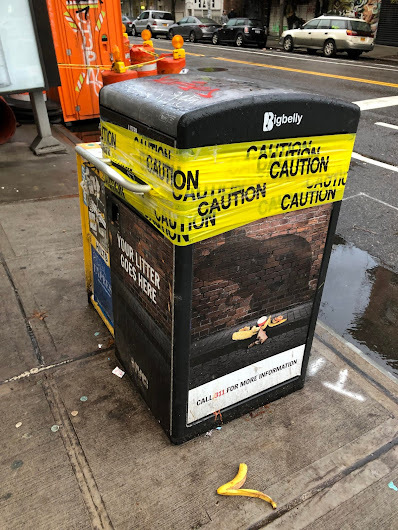 Even though a Butkovitz report waved a caution flag at the trash compactor program in 2010, it took another seven years for city to attempt to fix the problem. It did that last week when City Council approved a deal to bring in 275 new, improved trash compactors. Two big positives: the new ones will have a foot pedal for opening the door, and the city will get them free in exchange for advertising rights. The new deal also will outsource some of the maintenance work. “Basically it’s an acknowledgment that the city’s role for the last seven years hasn’t worked,” said Butkovitz, who is seen as a possible mayoral candidate in 2019. Williams said while the city initially claimed the trash compactors would save the city $13 million in personnel costs over 10 years, the actual savings has been half that – $6.4 million – because of the high maintenance costs. 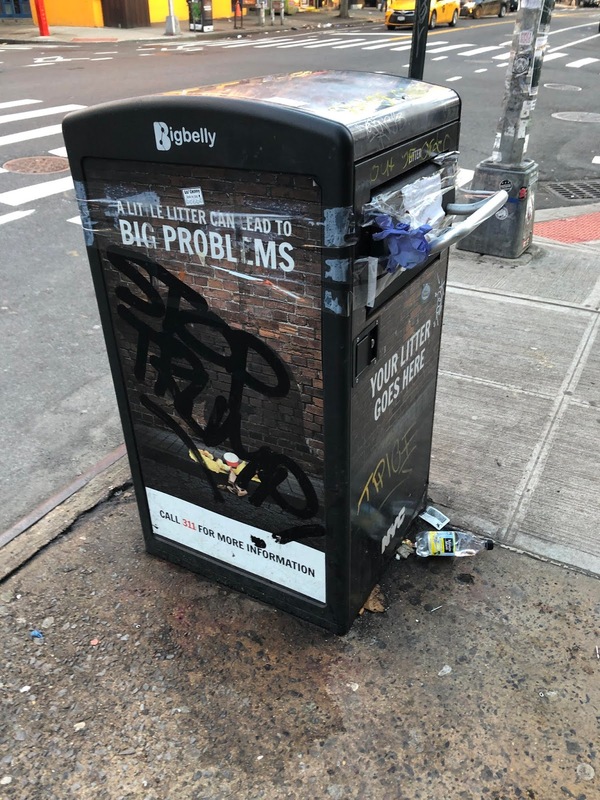 Ever wonder why dozens of these solar-powered trash cans were installed below the surface of the ground inside the Union Square Subway station? There's no sun there to power them. At $7,000 each, can you imagine what a waste of taxpayers' dollars those subterranean trash cans are? How is a Big Belly out of order? Indigestion? Does anybody have a Big Tums? I'm sure I'm not the only person who noticed that it didn't take much before people would start stacking their trash on top of the cans when they became full; this happened particularly when there was an event in the park—like every weekend. 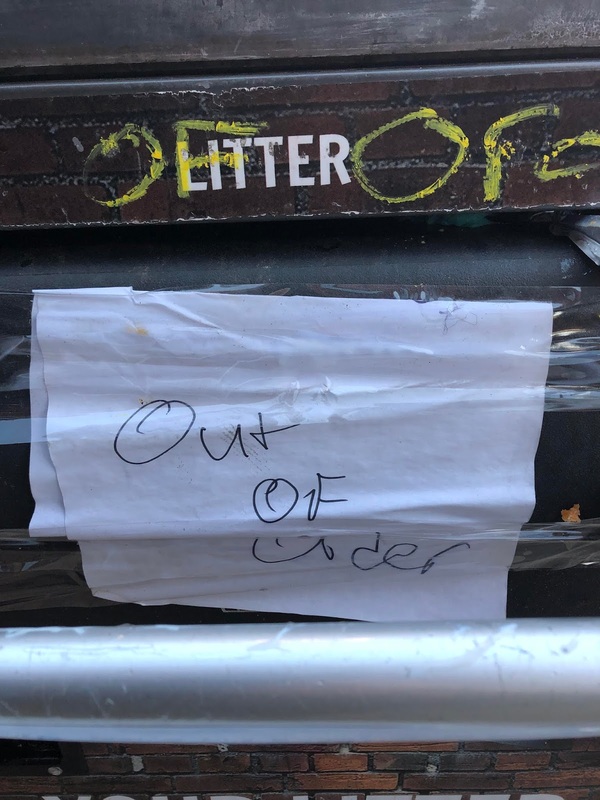 It was, I guess, a well-meaning gesture—and you know what the road to hell is paved with—but utterly misplaced; the garbage and half-full drink cups certainly did nothing to discourage the rats. Our species is on track to become extinct in less than 9 years, and I say it's about time! Pretty sure that banana peel is mine. Not kidding! What we should have are color-coded bins for -- food, paper, and plastic-metal. I am outraged that the city forces -- and fines -- residents --but not the tourists and out-of-towners who dump their garbage on us. If you look at what people put on top of these bins as well as in most garbage cans, the biggest single source of trash is Starbucks paper and plastic cups ans straws. Why doesn’t Starbucks have to kick in some funding in return for the city taking care of most of their trash? Starbucks does pay plenty through their property and business and sales and wage and utility taxes. Starbucks should be fined like anyone else. They should stop selling disposable cups and make customer use reusable ones. What're you gonna do? Stop going to Starbucks.